Two men jailed for permitting the "rampant" sale of ecstasy at a Devon nightclub have lost their appeal against their sentences. Manoucehr Bahmanzadeh and Tom Patrick Costelloe, owner and manager of the Dance Academy in Plymouth, were jailed for nine and five years respectively. They have already lost an appeal against their convictions. Now they have also lost their case at the Court of Appeal in London against their sentences. Bahmanzadeh, who lived above the club in Union Street, and Costelloe, from Honiton, were both convicted at Plymouth Crown Court in July of allowing the supply of Class A drugs at the club. Lawyers representing the pair argued at the Court of Appeal said the sentences were "manifestly excessive". But three appeal judges disagreed. Lord Justice Leveson said: "The (trial) judge had the opportunity throughout a very lengthy trial to observe not only the witnesses, but to obtain a true feeling of the way drugs supply throughout the club was not merely permitted, but rife." 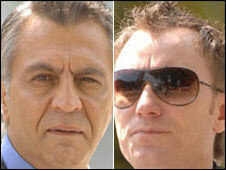 Bahmanzadeh and Costelloe were arrested after undercover police officers began monitoring the club in December 2005, eventually sending in 140 riot police to raid the premises in May 2006. Lord Justice Leveson said: "These were and are serious offences, rightly visited by the rigour of the criminal law." He concluded that those caught running businesses where drugs are supplied "must appreciate that they run the risk of being sentenced at, if not the same level, approaching the same level, as those actively supplying drugs".